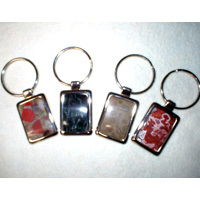 The stone key chains are made of chrome steel and are 3″ long. The stones on the key chains are available in Pudding Stone, Verde Antique Marble, Petoskey, and Kona Dolomite. A stone key chain makes a beautiful and unique gift for birthday, groomsmen, fathers day, boss’s day, retirement, and anniversary. This 6.25″ x 6.25″ x 3/4″ plaque is designed and constructed by the artisan to feature the State of Michigan depicted in stone. The lower peninsula is cut from Petoskey Stone, a 3.5 million year old fossil coral and Michigan State Stone. The Upper Peninsula is cut from your choice of 2 stones. Kona Dolomite, as shown on the left, is a pink to red stone found near Marquette. Kona contains Stromatolites, 2.1 billion year old algae. Verde Antique Marble is a green stone, with gray veins and comes from the Ropes Gold Mine near Ishpeming. The now closed mine was the only producing gold mine in Michigan. The Mackinaw Bridge is made from a copper nugget found in the Keewenaw. 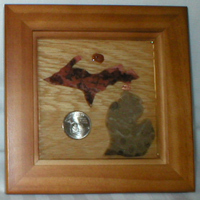 A new Michigan Quarter and Lake Superior Agate are included. This Michigan Petoskey Stone Plaque is perfect for a housewarming or hostess gift. Also makes a beautiful and unique gift for graduation, groomsmen gift, birthday, fathers day, retirement, anniversary, or new job. This 6.25″ x 4.25″ x 4″ keepsake box is made of Black Walnut and lined on the inside bottom with green felt. 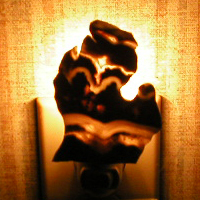 The top is designed and constructed by the artisan and features the State of Michigan depicted in stone. The Upper Peninsula is cut from your choice of 2 stones. Kona Dolomite, a pink to red stone found near Marquette. Kona contains Stromatolites, 2.1 billion year old alge. Verde Antique Marble is a green stone, as shown on left, with gray veins and comes from the Ropes Gold Mine near Ishpeming. The now closed mine was the only producing gold mine in Michigan. 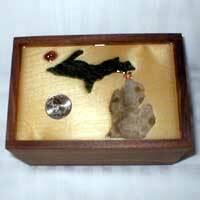 This Michigan Petoskey Stone Memorabilia/Keepsake Box is perfect for a housewarming or hostess gift. Also makes a beautiful and unique gift for graduation, groomsmen gift, birthday, fathers day, retirement, anniversary, or new job.